One of the ongoing challenges I am working on is a balance between colorism (pushing local color) and tonalism (photographic accurate value and color). A technique I have been using to mix very accurate color I call “brush in front”, which relies on accurate color spot mixing promoted by Charles Hawthorne and Henry Henche (see the text “Hawthorne on Painting”). This method differs from how I (and most artists) usually judge color, which is strictly be relative relationships of one color to another. This is just another approach, either can work equally well. 1. POSITION YOURSELF: Find a scene to paint that will allow you to set up your easel so that the light is behind you, and never directly in front of you. Set your easel up so the your canvas is in the shade. This usually means you’ll have to angle your easel at a 45-90-degree angle from the scene your painting. 2. BRACKET YOUR VALUE SCALE. In general, the range of pigment values from black to white isn’t sufficient to represent nature’s light range, which causes us to make some compromises in a painting by working within the practical range of pigment. In general, I find this technique best suited to subjects where the value range fits–but how do you know? I test for a match by comparing the lightest light in the scene against white paint and the darkest dark in a scene against black paint. Dip the back end of your brush with white, then black, and compare, making sure that you compare the sun-lit side of the pigment on the brush (not the shadow side) to the scene. Place the brush in your line of sight between you and the part of the scene you’re comparing. For example, for the seascape below, I dipped the back end of my brush in white and placed it in my line of sight between me and the foreground white-water waves, which represented the lightest color in the scene. Normally, white is light enough for a landscape scene and black is not dark enough, but close. Realizing that the darkest darks in an outdoor daylight scene represent a very small space on the canvas, I don’t worry about it, but instead make adjustments for the values around the darks to compensate. 3. TEST COLOR SPOTS. With your canvas and easel in the right spot, and having tested the range of your pigments with the scene in front of you, you’re now ready to mix paint! I still work from dark-to-light. In the screen shot to your right (click to enlarge), I mixed the color of the rocks just below the white wave. I keep mixing until the color on the brush (remember, the lit side of the brush, not the shadow) matches the color spot in the scene. Usually, this involves starting with a larger pile of base color that comes close, and then adjusting–typically with complementary colors to gray the base color, or warms or cools to adjust the color temperature. Even on this small pochade easel palette, I will attempt to keep base colors intact, and branch out color strings from there. A “color string” is a base color modified warm, cool, or complementary, but of the same value–this last point is important. If you want to get vibration in your painting, place these slight variations of color adjacent to each other, but keep the value the same. Only do this in areas where you want the eye to go, the center of interest, etc. Here are two paintings done recently using this technique. The first is the seascape I did when taking the screen shots above, the second from the recent Gold Country Plein Air show. I tried to limit the number of color spots to focus on, in this case, just 6: the sky, ocean water, wet rocks, dry rocks, sand and foliage. To add some interest (eg, foreground rocks), I used color strings of warm, cool and complementary colors. One thing that surprised me in this painting was how dark the sky ended up, but in the end, I think it reads well (click to enlarge). It also surprised me (somewhat) how important grays are, and how many of them there are in a scene. Save the color for where it counts. 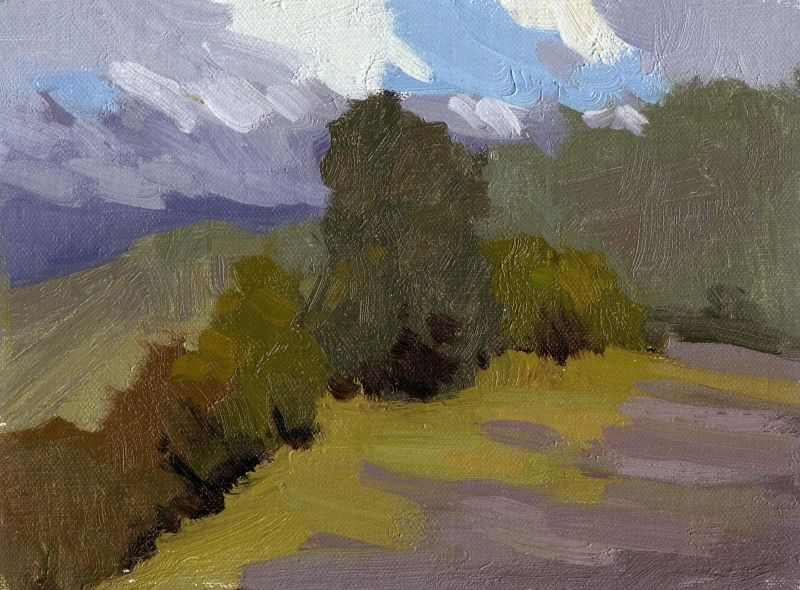 In this sample, the color variations in the foreground foliage were very, very slight. I think there are some nice color harmonies going on here. 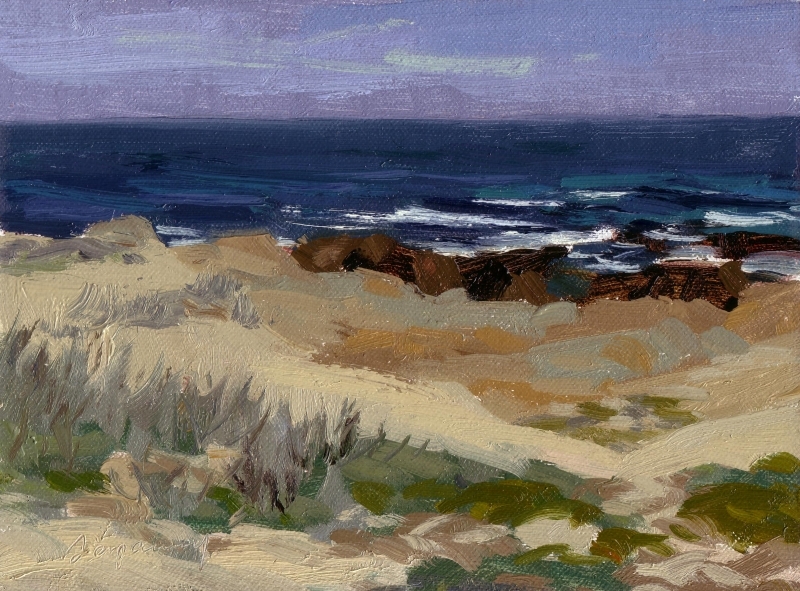 Both paintings are available–since they are studies–for $100 each (Pacific Grove is SOLD). Email me if you’re interested. If you try this technique, send me URLs to your images and I’ll update this page, enter comments with your own experiences and observations.